FERGUSON, Mo. (AP) – Backlash over the images of protesters in Ferguson, Missouri clashing with officers in combat gear drove an ongoing national push to scale back the militarization of police. Now, in the span of six days, police suddenly have a pair of poster cases for the use of such gear. California police officers deployed armored vehicles at the scene of a shootout last week with a married couple who had killed 14 people at a holiday party. 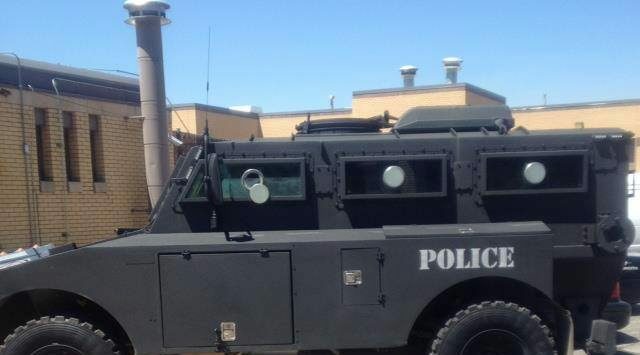 Officers in Colorado used armored vehicles last month to rescue people from the area around a Planned Parenthood clinic where a gunman killed three people. It’s too soon to say whether the mass shootings will quiet calls for demilitarization. But they have renewed the focus on how much military gear belongs on American streets.